Do you ever feel like you’re in the “everyone is pregnant” stage of your life? I do. Luckily, I also find myself pretty darn equipped for that phase. Another one of The Hub’s friends had their first child; a beautiful baby girl. They live all the way out in Arizona, so I was struggling to figure out what to knit. Phoenix babies don’t really need cardigans. Then I found out that their nursery and baby shower was going to be elephant themed. So I proudly present to you: yet another Elijah! I had previously done an Elijah by Ysolda Teague for my latest niece. Before then (pre-yarnsley lane) I have made several as well. I am a huge fan of the pattern. It always turns out adorable. That being said, I am declaring an elephant hiatus for myself. I need a break. 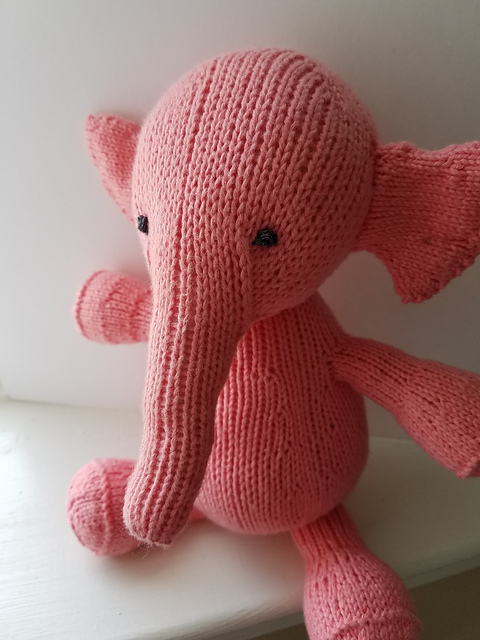 While Elijah always brings a great result, it is somewhat fiddly to knit with all its arms and legs and trunk and ears. It also requires me to use double pointed needles, which is a nope for me. There’s really no other way to pick up the stitches for the arms and legs but to use the DPNs. So I get it. I get why it has to be that way. But I hate it. 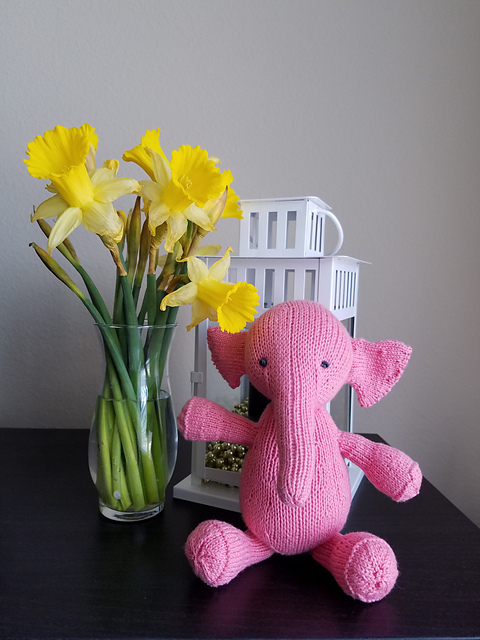 All fussing aside, I happily make little Elijah elephants for whatever baby needs them. 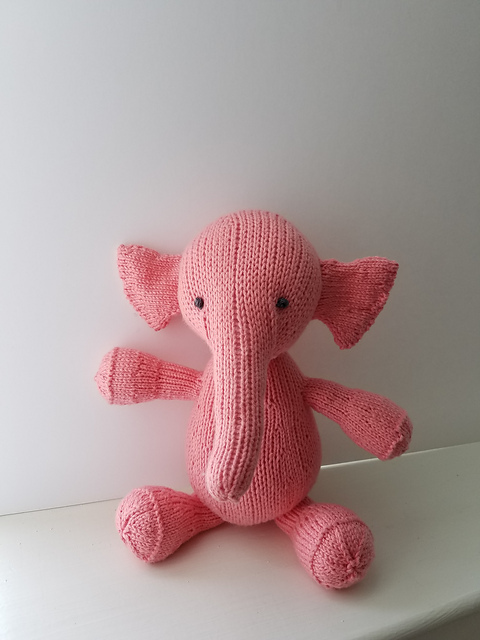 I will continue to make little Elijah elephants for future babies as well. But can we space them out a little bit? Lets do that. However, I had some real issues with laddering on this project. I don’t typically struggle with laddering, but the Bamboo Pop really seemed prone to it. It also seemed like it was pilling a little, which was weird. I think it will be fine in the end. It’s washable and the laddering wasn’t that noticeable, but I will use something different for the next Elijah. Now, I have at least two pregnant ladies in my office that I need to knit for, and I am fresh out of ideas. 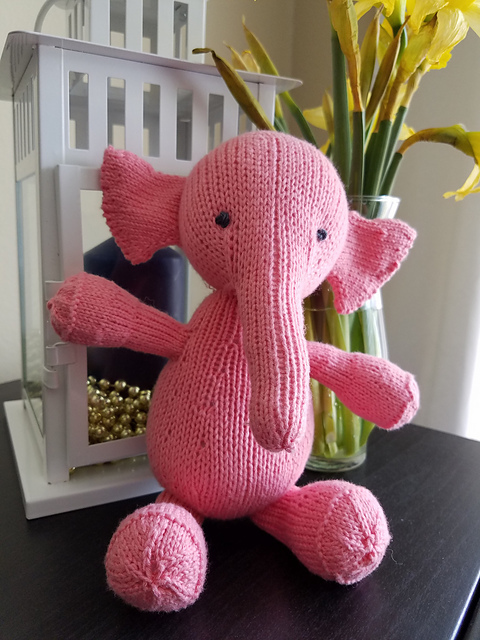 Any non-elephant suggestions for cute little baby knits? I’m thinking the recently released Beloved by Tin Can Knits or the Twinkle Twinkle Baby Blanket by Helen Stewart would be fun to try.